The Etymotic Research MC2, the headset version of the dynamic-driver MC5 model, is currently available for $19.99 + shipping from amazon.com (sold by 3rd party, so not prime eligible). The MC2 typically runs $80-100. The MC2 features a microphone and single-button remote and is compatible with Apple and most Android/Windows Mobile devices. Otherwise it is identical to the MC5 model, which I reviewed here. This is the lowest price we’ve seen on any variant of the MC5, making it less expensive than Etymotic’s entry-level earphones, the Ety-Kids EK5, and a highly recommended buy for clear, detailed sound. Hey Joker, really appreciate the pointers towards decent earphones! After finding out about the etymotics, I’m trying to chose between that and the flux. Taking into consideration that both would come at roughly the same price for me (I have to use forwarding for the etys). So, which one would be the better choice? 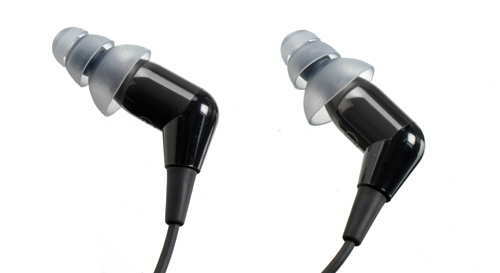 They’re both great earphones – in the end it’s going to come down to what type of sound you prefer. The Flux is going to have more bass and more recessed mids. The MC2 will have less bass depth and impact, but more midrange presence with better clarity. Etys don’t have enough bass for some listeners, especially coming from cheap earbuds, but once you get used to them the clarity can be eye-opening. If you’ve never tried a flat/neutral-sounding earphone before I’d lean towards the Flux as the safe choice. By the way, if you plan to use them with a computer and need the mic, and your computer has separate audio and mic jacks, you might need an adapter to use either of these as a headset for gaming. I’ll post more of these – wasn’t sure there would be interest. Posted this one because I’ve never seen any Ety set at this price before. So I’m looking to buy a pair of earphone and I’m having difficulty between choosing these(due to the sale) or the steelseries flux at 50$. I mainly listen to EDM, trap, dubstep and the occasional pop music. For that type of music you really want the SteelSeries over the Etymotics. They have better deep bass and a more suitable presentation in general. Do you have any other IEMs that you would recommend over the SteelSeries Flux In-ear and are under 75$? For the types of music that I listed. If you need a mic, the Flux is pretty much tops. If you don’t need headset functionality you have other options, such as the VSonic VSD1, which is a little clearer but not as smooth as the Flux. I prefer it slightly to the SteelSeries. There’s also the new MOE-SS01 for a slightly brighter sound (https://theheadphonelist.com/headphone_review/moe-audio-moe-ss01-review/) and the Audio-Technica CKM500 if you want lots of bass (https://theheadphonelist.com/headphone_review/audio-technica-ath-ckm500/). All good options, really.